Buffer and electrolyte solution vials show on the label the most basic certification information. To get access to the online certificate service, the respective LOT number is required. 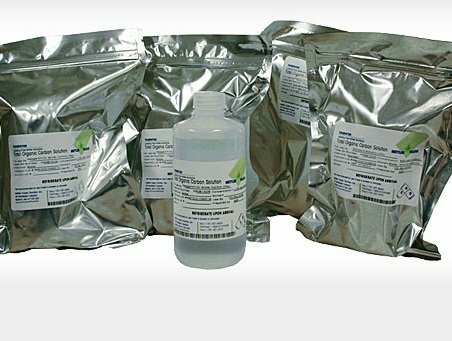 By clicking the link below, you will be lead to the quality certificates data base, where all related certificates for buffer and electrolyte solutions can be found. 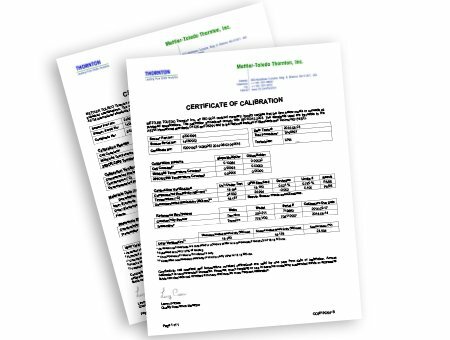 Calibration Certificates for Thornton, 2-Electrode sensors are available for download at your convenience. This database currently holds the most recent calibration certificate as of January 1, 2014. This is a free service to our customers. Upon completion of a brief, 1-time, registration you will receive a password for access to the database. Simply enter the serial number of your conductivity sensor to view, download, or email a link to the Certificate. Within this section you can find all available product related declarations of conformity (CE). To download the required pdf-file, please select the respective link from the section "Documentation" (click "more" to see the entire collection). Product related CEs can also be found in the product section directly. Conductivity standards are produced, analyzed, and documented in the Mettler-Toledo Thornton ISO 9001 certified facility with processes similar to those used to calibrate high accuracy Thornton conductivity sensors. They are packaged in sealed containers to assure retention of the certified value for the full shelf life. These standards are analyzed and used at equilibrium with the atmosphere. MSDS are lists of components contained in chemical substances. They explain certain characteristics of chemicals. In case of an accident you will find information on what measures have to be taken. METTLER TOLEDO provides numerous product and material related types of certificates as for ATEX, hygienic design, PROFIBUS® PA, HART, Foundation Fieldbus, safety and others. You can download the required file in pdf-format by selecting the link within the "Product Documentation" in the right panel (click "Learn more" to see the entire collection). Product related certificates can also be found in the product section.